Things like the Thirtieth Anniversary Concert Celebration are confusing to me. If you go to the Wikipedia page you get a listing for it as a double-album. Even this is a bit of a disaster (two different songs are listed as the sixteenth song, for example), but I think it is an accurate ordering of the tracks. If you watch the broadcast (recently re-released) you see that the album does not sequence the tracks in the order that they were played on the night of 16 October 1992 in Madison Square Garden. 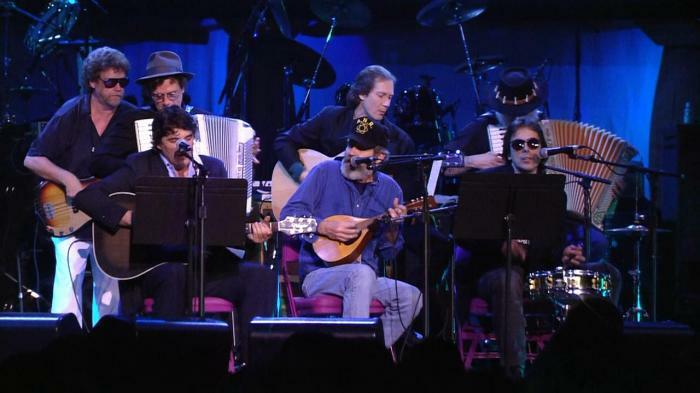 Bjorner notes that John Hammond was to play “I’ll Be Your Baby Tonight” but that the song was scooped from him by Kris Kristofferson, so Hammond did “See That My Grave is Kept Clean” (which Dylan recorded, but did not write). That doesn’t appear on the album nor on the video. Bjorner also lists Dylan as doing five songs, where he does four on the video. Missing is “Song to Woody”, which is probably the song I would have most wanted to hear him perform on that night. Aargh! Now I will need to hunt that down…. I absolutely remember watching this show live on television. I don’t know who aired it in Canada (also sources note that it was aired by a wide range of channels – it wasn’t like an NBC special or anything). I guess probably MuchMusic up here, but that’s just a guess. I also remember liking it, and, of course, for more than twenty years I have recalled the Sinead O’Connor segment and how angry it made me at the time – how much I hated that New York audience, how much I respected Kristofferson and O’Connor, and how I was sad that Dylan didn’t acknowledge the incident. The mythical Bob Dylan that was stuck in my twenty-three year old mind would have done something to that audience, but it didn’t happen. I was an enormous fan of Sinead O’Connor from the time I was twenty years old. I can recall with absolute total clarity the first time I heard her sing. I was driving down the QEW with my friend Marc towards Toronto and we were listening to CFNY (the new wave station in Toronto) and they played “Mandinka” from her first album. We thought it was just the greatest thing ever. When the song ended the deejay, Alan Cross I am almost positive, literally picked up the needle and put it back at the start of the song and said something to the effect of “nothing we’re going to play here today is going to be better than that, so we might as well do it again”. I know that I bought the single later that day. O’Connor appeared on Saturday Night Live on October 3, 1992, two weeks before what Neil Young termed “Bobfest”. During that performance she sang Bob Marley’s “War”, announced “Fight the real enemy” and tore a picture of Pope John Paul II in half. I remember watching that live and thinking “Wow, that was really great”. Of course, the conservative press went bonkers. SNL behaved rather shamedly, with Joe Pesci threatening her with physical violence on the following week’s monologue. Madonna later ripped up a picture of Joey Buttafuoco on an episode (young people, look that up) because even then she was afraid of seeming washed up. I remember that was one of the first times that I thought Madonna was getting pathetic. Anyhoo, so when O’Connor came out to sing “I Believe In You”, one of Dylan’s most touching Christian songs, the New York crowd was pretty split between people who cheered her and those who booed her. The booing part of the crowd persisted longer, and eventually it becomes clear that a beautiful, quiet song like this one is not going to go off as scheduled. Kris Kristofferson then comes out and tells her “Don’t let them get you down” and she defiantly says “I’m not down”. She thens waves off the band and does “War” again. I thought it was great. I also thought, this ridiculous crowd. These were the same people who booed at Newport. Of all the things to be booing, and at all the venues. Well, it seemed very very wrong to me at the time, and it bothers me even more now. At the time I was sad that Dylan let it pass unremarked upon. Today I realize that a) he might not have even noticed; and b) he probably didn’t care any more. The Dylan of 1992 was not the Dylan of 1964, not by a long shot. It was her battle, and I probably shouldn’t have expected anything from him at all. Rewatching the concert over the past two days (it is soooo long) I was struck by how great most of these songs are as songs. Listening to this much Dylan all in a row, you get a sense of decline. 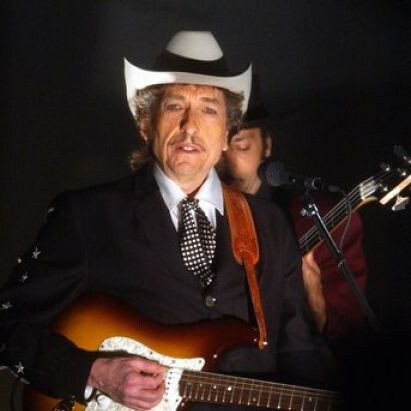 Last week I listened to Bootleg Series 1-3 as a 1991 release but ran out of time to write it up. Too long didn’t read version: It is remarkable to go back in time to listen to the Dylan that had all the promise in the world. To realize again how great he was so fast. I can still find things to like in 1990s Dylan, but even his cast-offs in the 1960s and 1970s were so much stronger. Following the Ottawa concert in August with a show like this where Shawn Colvin, Mary Chapin Carpenter and Roseanne Cash just kill a song like “You Ain’t Going Nowhere” is almost unfair. That’s a song I’ve never really thought was that good, but last night I thought it was one of the greatest things ever written because they just brought such joy and life to it and made the goofball lyrics breathe. And then you recall that a young Dylan probably wrote than in ten minutes while stoned in a basement. Wow. The Thirtieth Anniversary Concert Celebration is almost all like that. The O’Jays doing “Emotionally Yours”. Stevie Wonder doing “Blowin’ in the Wind”. So great. There are moments where songs are elevated well past what Dylan ever did with them. The best example, undoubtedly, is Lou Reed doing “Foot of Pride”, a lyrically brilliant Dylan piece from the 1980s that he himself doesn’t do justice to. Reed has to read the lyrics off the teleprompter, but if you listen to the CD that isn’t apparent. It’s a great piece. There are a lot of likeable moments on the show. Eric Clapton, who I generally don’t like, does two songs (“Love Minus Zero/No Limit”, which is not on the album, and “Don’t Think Twice, It’s Alright”, which is) but then pays a lovely homage to The Band when he introduces them. They appear with two accordions (!) but no Robbie Robertson, who is one of the most notable absences (Elvis Costello, who often guested at Dylan shows, and Van Morrison, even more so, were both scheduled no-shows – wonder what the issues were?). Nothing is a disaster, at least nothing that made it to the album or to the video. GE Smith is back leading the band for the night, and I will say that I need to give him credit: he does a remarkable job. If you just watch him leading the multiple singers and guitarists through “My Back Pages” alone you’ll recognize that he has a great relationship with Dylan, and his time on SNL made him comfortable directing musical superstars. I still don’t think that highly of his tours with Dylan, but he comes across really well on this night. As for Dylan, well I haven’t heard his “Song to Woody”. His “It’s Alright Ma (I’m Only Bleeding)” is more than fine. It’s not a disaster like the Grammy show or the Letterman 10th Anniversary show. His voice seems limited, but he acquits himself real well. He plays the song solo acoustic, and his guitar-playing is right there, so I don’t know what was the problem with some of his recent debacles on that instrument. He does “My Back Pages” with Roger McGuinn, Tom Petty, Clapton, Neil Young and George Harrison – it works well and the crowd is super into that. “Knockin’ on Heaven’s Door”, with the whole ensemble, is sort of blah, the way these huge group things always are. Sinead stands on stage with her arms crossed and scowling – seems like they did get her down. Finally, everyone leaves and Dylan does a solo acoustic “Girl from the North Country”. It’s great. If that had been the last time anyone ever saw him onstage it would be legendary. Of course, there was no chance of that! Dylan immediately went back on the road again. This show just a one-off distraction. The whole thing was quite good, really. Hard to imagine that it could have been much better(the low light for me would be the guys from Pearl Jam and Vedder’s one-note singing on “Masters of War”). It did a fantastic job of establishing Dylan as the legendary artist to a new generation after a series of recent misfires like Live Aid. For a brief moment Dylan might have even been cool again.